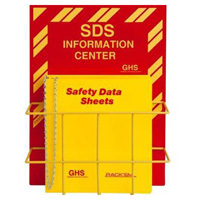 Title: 06/14/1990 - Concerning the conditions under which material data safety sheets are required. Thank you for your letter of May 21 to the Occupational Safety and Health Administration (OSHA) concerning the conditions under which material data safety sheets (MSDS) are required. OSHA's Hazard Communication Standard (HCS) requires that chemical manufacturers and importers assess the hazards of the chemicals and products they sell. Under the HCS, manufacturers or importers of chemicals or materials that may create a hazardous exposure during their use are to provide hazard information through warning labels affixed to all containers of their products and through the provision of MSDSs to all downstream recipients or users of their products. The labels must include the identities of the chemical hazardous substance, appropriate hazard warnings and the name and address of the manufacturer, importer or responsible party. Chemical distributors must also adhere to the labeling requirements of the standard, and must ensure that MSDSs are provided to employees. If you manufacture a product that will be imported into and distributed to employers within the United States, you, as the manufacturer or importer, must perform a hazard determination on your product to determine if, under normal conditions of use or in a foreseeable emergency, employees using the product could be exposed to a hazardous chemical, as defined under the HCS. If so, it will be necessary for you to develop appropriate hazard information as described above (MSDSs and labels) to accompany the product in its distribution into the United States. For your information, the New York building code you refer to in your letter is irrelevant to OSHA standards.